It is said that history is written by the winners. I disagree with this notion, for if that was the case wouldn't pigeons receive a better press? Pigeons have managed to evolve and out compete countless other species, they have successfully migrated and colonised the entire world - wherever humans can be found pigeons can be found not much further behind. Yet, many people see these charming creatures as rats with wings. Furthermore, this opinion persists because too few biologists are interested in educating the general public about the animals that live in close proximity to them, instead they are cheap sell-outs that are seduced by the exotic. This masterpiece seeks to bring truth to the fore and to reconcile humanity and pigeonkind. This website is an extension of the in-depth ethnographic studies that I have conducted over the last decade. Although I come from an academic background, I realise that many other pigeon fanatics don't know their psychogeography from their action research and this website is written in simple English and aimed at the layman. Further details on the methodologies used can be found in the 'Evidence' section of the website. *Pigeons with incomplete feet are generally missing one or more toes. This seems to be caused by a variety of factors, the most commonly cited are thread or string getting stuck around toes (the reduced blood flow may lead to them falling off) and pigeons spending far too much time sitting in their own waste (infections can lead to bumble foot). 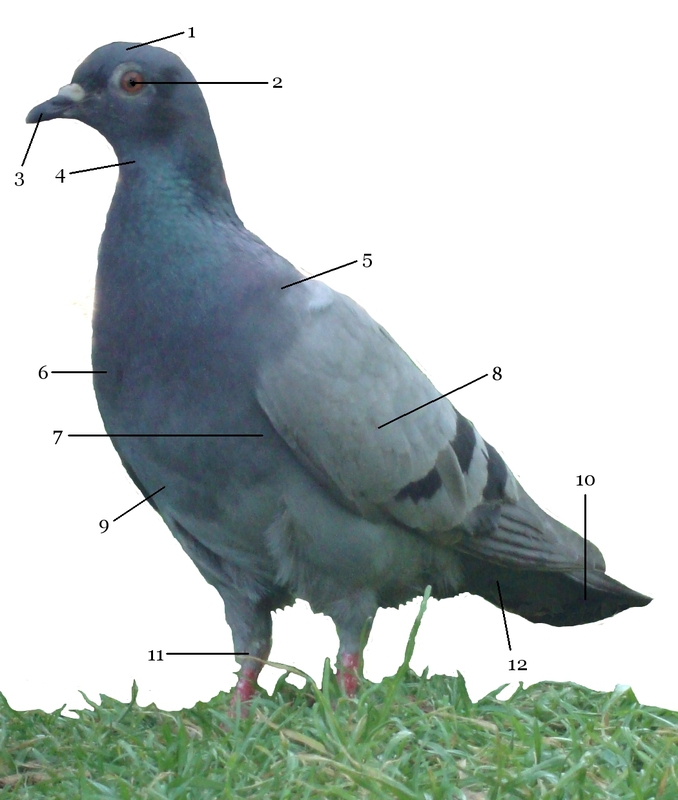 The diagram below shows the key features that pigeons tend to have on the outside of their body. 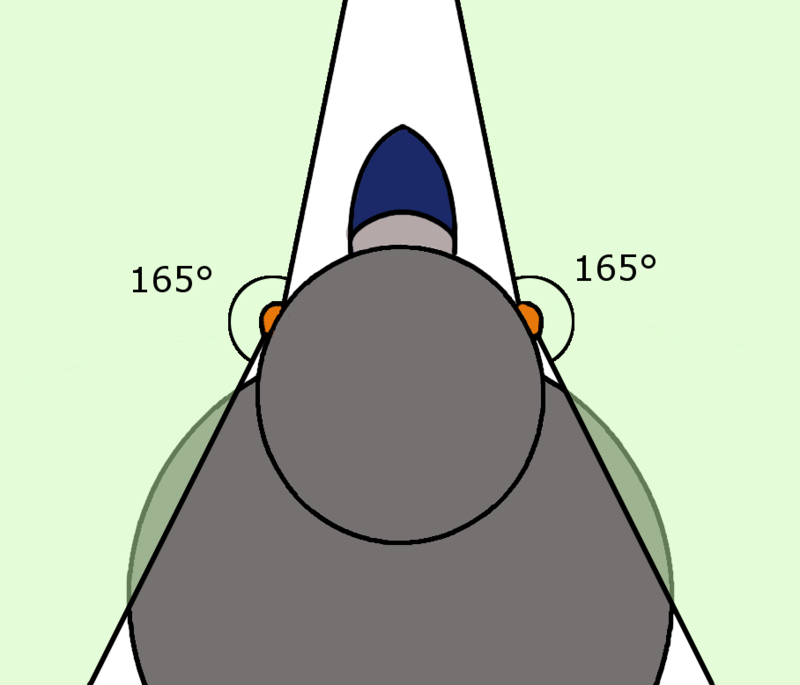 In depth information on some of the key features of a pigeon follows. Wings - These are made from feathers. Interestingly, feathers are one of the lightest substances known to man (the chemical structure of these is a mystery to scientists), reportedly even electron microscopes are unable to provide answers about what they are. The main purpose of wings are to look majestic and conveniently they also seem to aid the pigeons in flying. Beak - Beaks are predominantly part of a pigeon to allow for the consumption of food, they can also be used to crack open hard foods. Pigeons also use their beak to groom and scratch themselves. The beak has also been observed to act as a useful tool to annoy other pigeons. Sometimes pigeons open their beak and simultaneously produce a sound, it is thought that they do this to let each other know where they are. Eyes - Pigeon eyes work in much the same way as our eyes, however the key difference is that they can only see in two colours: red and green. As a result of this, some scientists are currently investigating pigeon eyes to see whether they may hold the secret to curing the red-green colour blindness which some humans suffer from. Pigeon eyes are placed on the side of their head, the main reason for this is to enable them to have a wider field of vision. The reason for this is two-fold, firstly it allows them to see any predators who are trying to creep up on them, secondly it means that they can take in more of the beautiful views of London from the places they perch upon. Pigeons have acute eyesight, they have a high density of photoreceptors which mean that their vision is twice as sharp as that of humans. This feature enables them to spot food from a long distance. Legs - There are two main advantages which have meant that pigeons have evolved to have legs. Firstly, at the end of their legs pigeons have toes, these toes are curly and provide excellent grippability which is required for them to be able to perch on objects. 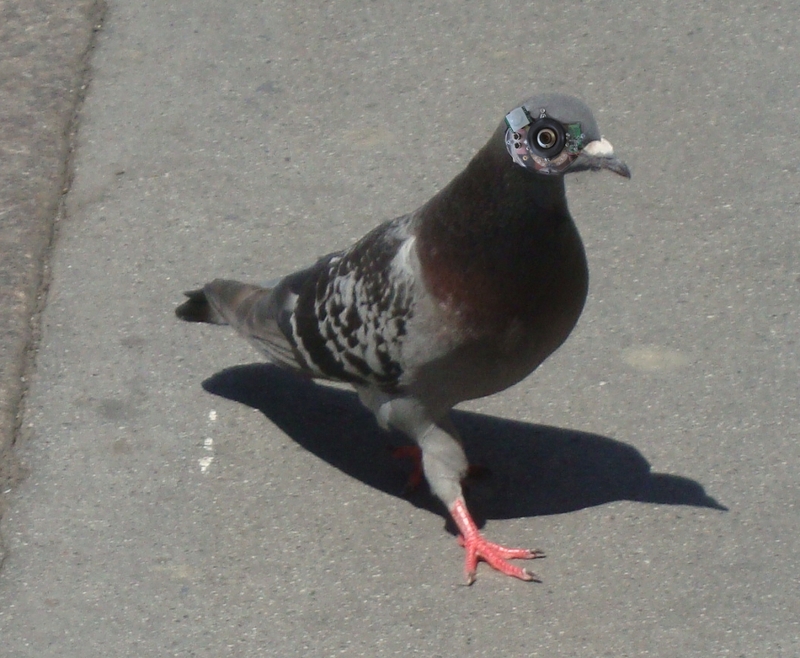 Secondly, pigeons also require legs in order to be able to walk. Despite pigeons being able to fly (and this being a much cooler method of transportation than walking), most pigeons decide to spend much longer walking every day than flying. This has led some experts to suggest that pigeons may suffer from vertigo, but this claim is unsubstantiated. Tail - In the past it was assumed that the pigeon tail was mainly there for aesthetic reasons. A finely groomed tail was found to drive male pigeons insane with lust. It is thought that the phrase 'chasing tail' may originate from this. However, academic thought on pigeon tails has advanced somewhat over the last decade. 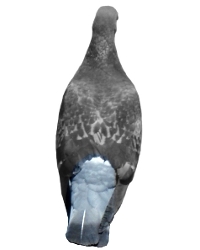 Recent experiments have suggested that the tail also acts as a rudder, allowing pigeons to fine tune their flight paths. It is also now thought that tails may also be there to help pigeons balance when they are perching on a branch. In order to discover more about pigeons anatomy and physiology a number of lab tests were carried out. 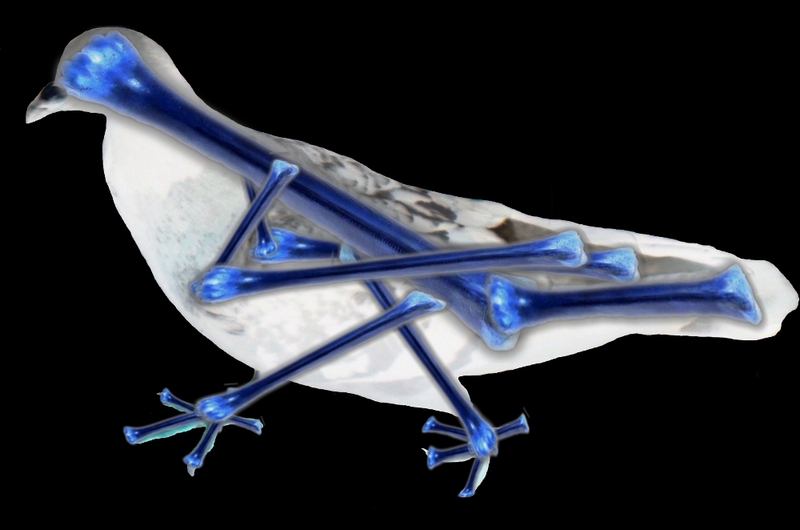 Pigeons were x-rayed in order to find out more about their skeletal structure, the figure below shows the skeleton of an average pigeon. Pigeons have an atypical skeleton compared with most other birds as they only have 16 bones and half of these are in their feet. Unlike most animals, pigeons do not have different vertebrae forming a spine, instead they just have one long bone which forms their skull and extends all the way down to their tail bone. The pigeon's leg bones run from their ankles all the way to the backbone and they are partially fused to their back bone. This physiological anomaly explains why pigeons' heads move around each time they take a step. Most bird bones have a high concentration of Calcium Phosphate, which gives them a hard and rigid structure. Birds also typically have largely hollow bones, this minimises their weight and allows them to take flight more easily. My studies have led me to observed that pigeons are somewhat different to our other feathered friends as their bones are made from solid titanium. Titanium is an extremely strong and lightweight metal which is ideal for an endoskeleton. Titanium is now routinely used in human medicine (e.g. in hip replacement). This idea was taken from pigeons. The skeleton of a pigeon and the fact that their bones are completely different to other birds' bones suggest that pigeons are unrelated to other birds, but that their similarities have come about due to similar evolutionary pressures (convergent evolution). It is my belief that pigeons evolved from cats, whereas most birds are thought to have evolved from dinosaurs. Pigeons have a very high brain to body mass ratio. The academic literature on pigeon intelligence is fairly non-existent. This is partly due to the difficulty in administering traditional IQ tests to pigeons: they have a notoriously short attention span and furthermore find it difficult to hold a pen. Fortunately, the detailed notes on pigeon behaviour I have kept over the last decade are crammed full of anecdotal evidence which reveals that pigeons have higher cognitive abilities than many experts have previously realised. Whilst some birds have been observed to use tools (such as crows using sticks to obtain food which is in hard-to-reach locations) pigeons have never previously been observed to demonstrate this behaviour. However, as part of this study it has become apparent that pigeons use public transport to travel around when they are tired. The supposition that pigeons use trains as a tool to move around was first hypothesised when it was noticed that very high densities of pigeons hang around railway stations. Although a pigeon has never actually been observed to board a train, no other plausible explanation has been found for the high number living in railway stations. This has lead us to believe that they must be sneaking on board surreptitiously (potentially because they have not paid for their fares and they are hiding from conductors). Pigeons also display some capacity for object permanence. Experiments where food is shown to pigeons and then hidden under a small cardboard box have revealed that sometimes they remember where the food is! Some people say that pigeons are one of only 6 species to be able to recognise themselves in a mirror, I have never seen convincing evidence of this. 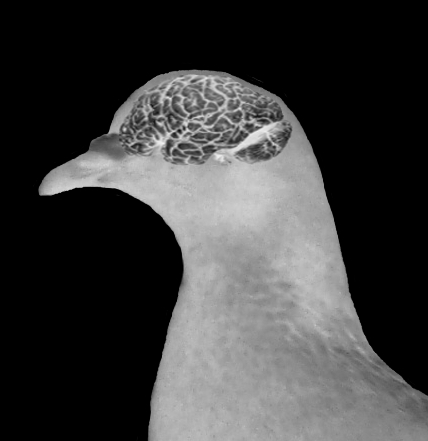 The following figure is an image taken from an MRI of a pigeon brain. The most important thing to note is that a pigeon's brain is about the size of their head! It largely looks the same as most brains in the animal world. Although we cannot be completely certain as to why pigeons have brains, it is believed that they allow pigeons to concoct thoughts and to control their bodily functions. As part of this study 15 pigeons were caught in cages, once they fell asleep they were then weighed. This investigation shows that an average pigeon weighs 326g, which incredibly is less than a packet of sugar! Male pigeons were generally found to weigh slightly more than their female counterparts. 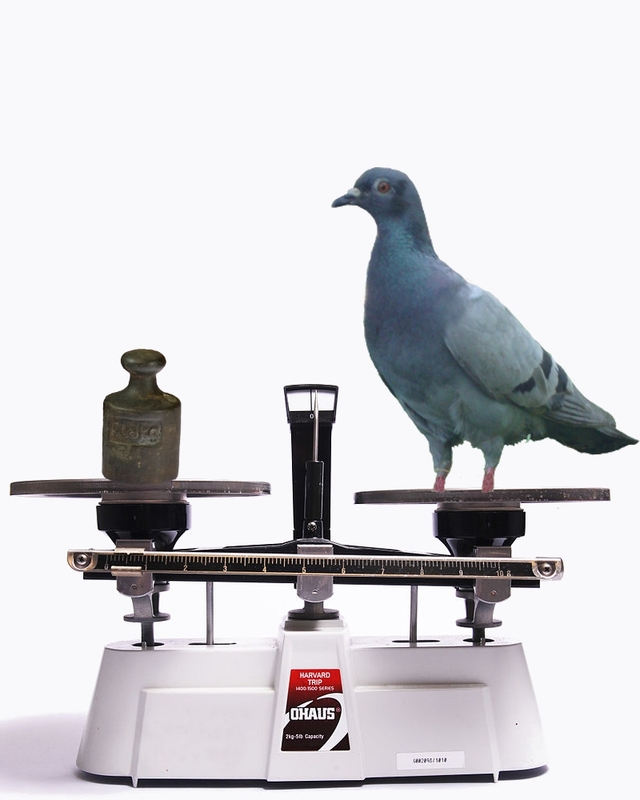 The average weight of a pigeon was previously thought to be closer to 300g and this new evidence is worrying in that it suggests that there may be a pigeon obesity epidemic - this issue is addressed in more detail in the 'Pigeon diet' chapter. The weighing process is shown in fig 5. 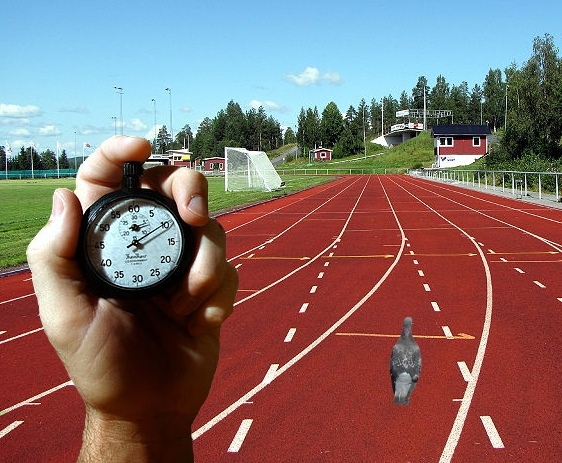 Pigeons have been observed to fly at speeds of up to 100 kilometres per hour, however, the academic literature previously did not contain any information on the walking speed of pigeons. I found this void in the academic literature unacceptable and decided to conduct my own primary research in order to fill it. A random sample of London pigeons were rounded up on a summer's afternoon in 2009 and taken for an exciting day out to the Linford Christie Stadium in Shepherd's Bush. An expert team of IAAF officials were invited to provide the official timing, but unfortunately they did not seem to be available as they did not return any of my calls. Fortunately a team of local school children volunteers were rounded up in time and they were used to time pigeons running speeds over three different distances: 5m, 10m and 20m. In order to ensure that pigeons ran in the intended direction, the volunteers had to chase after them, shepherding them in the most direct path possible. Any pigeons which flew off were discounted from the results and disqualified from the competition. In order to ensure that the pigeons remained motivated over the day, the fastest pigeon over each distance was awarded a prize - a KFC family bucket. The two figures below show the experimental setup and also the aggregated results. Pigeons are highly adaptable and are generally happy to eat almost anything. One of the trends observed over the last 25 years is that the diet of pigeons in London has become more varied; in particular pigeons now seem to eat a wider range of cuisine. For examples, not one pigeon in London in the 1970s was observed sampling falafel (a mediterranean food made from chickpeas), however, this can now be seen all over London every day. It is important to note that this is not because pigeons have learnt to cook for themselves and have been leafing through Mr Ottolenghi's latest recipe book. My belief is that this is because humans in London are now eating a wider range of cuisines and that this has a trickle down effect on the diet of pigeons as humans have a habit of leaving edible waste in places which pigeons can find it. 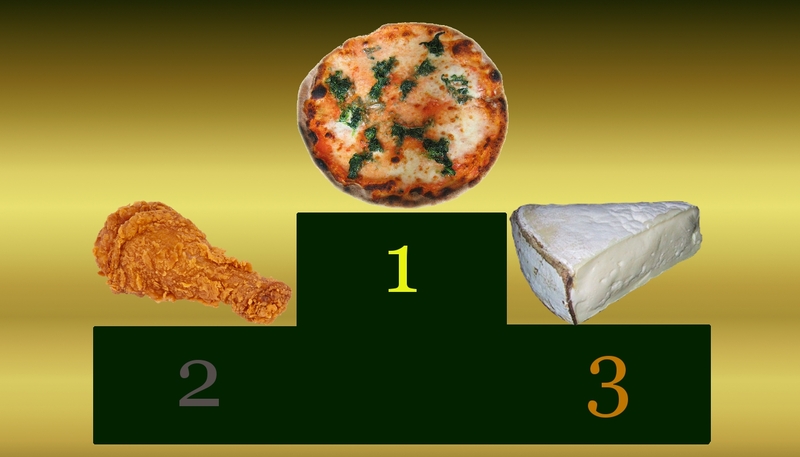 In order to determine what pigeons favourite food is, a complex scientific experiment was carried out. Pigeons were simultaneously offered two different foods at equidistant points, and their choice was recorded. the experiment was carried out multiple times with 28 different pigeons and the results were collated. Complex statistical techniques were used to determine pigeons' food preference. There are many positives to the increasingly varied diet pigeons have. For instance, fewer pigeons have rickets than 25 years ago. Furthermore pigeons have also broadened their horizons by eating foreign food; this has led to increased migration and holidaying around the world. Unfortunately these positives are outweighed by a number of negatives. The change in pigeon diet has led to an obesity crisis, in fact many pigeons now score as obese on the BMI (Bird Mass Index). London pigeons are now on average 20% heavier than they were 20 years ago. There have been recent news stories about there being an increase in the number of wood pigeons in London, however, this is actually incorrect! This phenomenon has been misunderstood by many members of the public who have confused overweight pigeons with wood pigeons. The image below is of one of the many fat pigeons in London. I must urge you, my fellow pigeon fanciers, not to feed these gluttonous birds, please concentrate your love on the scrawny pigeons. Reports have reached us of gangs of pigeons mugging people for their food. All of these reports have been about fast food, leading us to believe that these foods have become addictive to some pigeons and that they are prepared to do anything to get their next hit. If you are outside with some fast food (in particular pizza which as demonstrated above is their favourite food) please exercise caution! It is hoped that the government will do a public information campaign to warn people of this danger and that the pigeons can be weaned off their addiction by feeding them increasingly smaller portions of pizza until they can go without. There has been an increase in the number of reports of pigeons pecking each other over the last few years. Our current hypothesis is that this may be related to pigeons getting used to eating fried chicken, it is possible that this may have given them a taste for bird and that they are starting to suspect that they themselves are birds. It is thought that if they make the connection, that this may lead to chaos and the eventual extinction of the pigeon. Reports of over-excited pigeons acting in an erratic fashion have just started to reach us. For instance, Ms Robinson of Sydenham reports having seen a pigeon charging around in circles whilst puffing out its feathers for no apparent reason. My hypothesis is that the pigeon diet has now become so high in unnatural chemicals that it is starting to short circuit their brains (much in the same way as it has been seen to occur in homo sapiens). Could this be the start of an ADHD in pigeons? I am not sure, but as a cautionary measure I am now crushing up Ritalin and mixing it into the wild bird seed that I distribute amongst destitute pigeons. Unlike their close cousin the cat, pigeons do not enjoy solitude. In fact one of their primary occupations is to maraud around in troops or squadrons. These troops are self-contained hierarchical units in which one pigeon is elected as squadron commander. Although the rules vary from troop to troop, observations suggest that on average a new squadron commander is chosen roughly every fortnight or so. The squadron commander lifestyle is very demanding as it involves marching around and cooing orders to their subordinates. Tracking pigeons is a difficult business for a number of reasons: pigeons are quite nimble; they can fit in small spaces; and they all look alike. 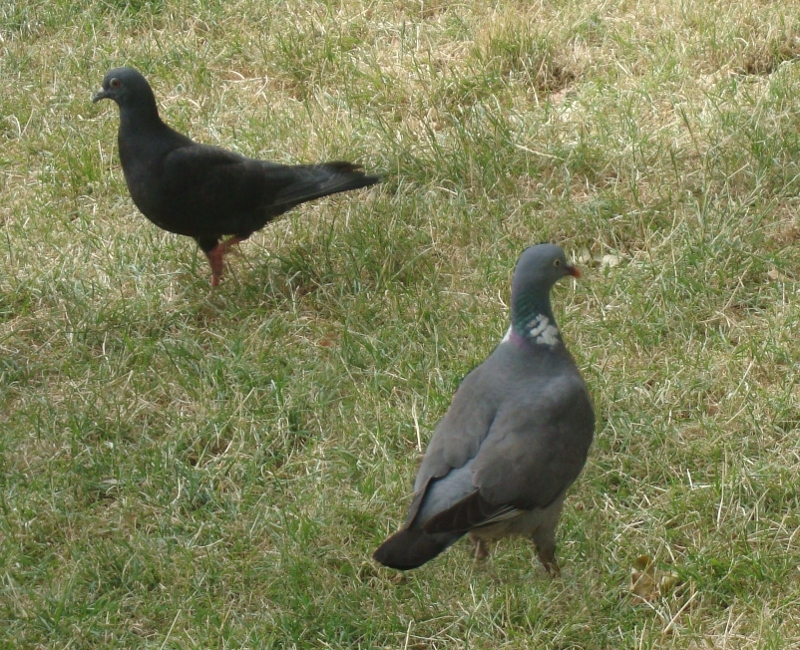 Unfortunately the budget of my project did not allow me to purchase trackers, so I had to spend several days in following pigeons in order to find out how much they move around in a typical day. 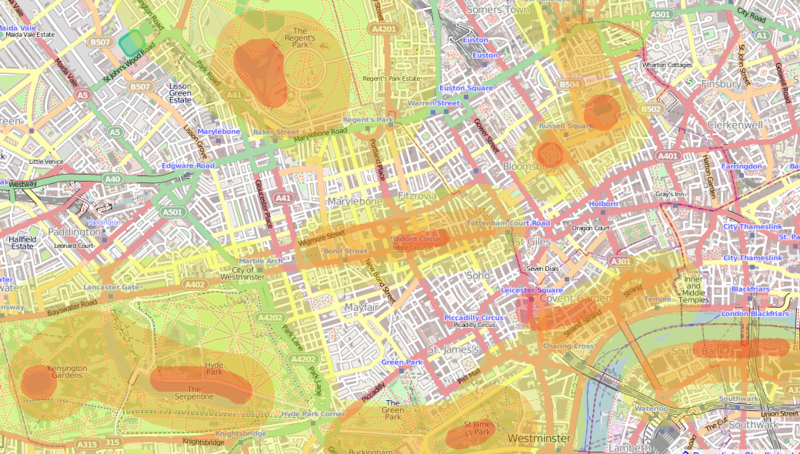 Data from one pigeon tracked around the Trafalgar Square area of central London is provided below. A number of pigeons were tracked and this data was aggregated in order to come up with a heat map of pigeon activity across central London. The findings (shown in figure 12) confirm that pigeon activity is highest in tourist hotspots, my hypothesis is that this is because this provides pigeons with a greater number of feeding opportunities. The sandwiches that tourists eat at lunchtimes leave a number of crumbs on the floor which pigeons eat. There are also some hotspots around ponds, my in-depth observations suggest this may be because of people feeding bread to ducks. Although people rarely throw their bread to pigeons, preferring to focus on the 'cuter' mallards, adventurous pigeons can occasionally swoop down and intercept bread. Furthermore, it has been observed that small children often throw the bread poorly and this allows sneaky pigeons to get a free meal. 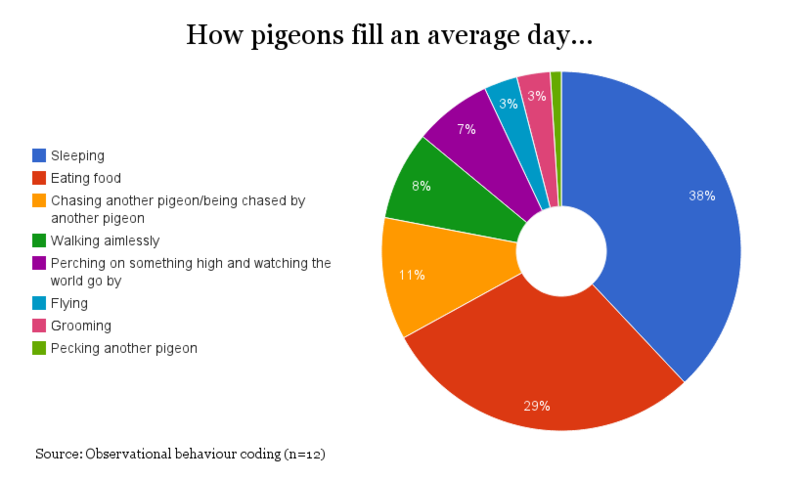 In order to get a good grasp of what pigeons do on an average day I engaged in observational research with behavioural coding. There were a number of methodological difficulties which had to be overcome: the main issue being that pigeons do not like being followed, they have a tendency to run away and if they get spooked they can also fly away. In order to overcome this issue the volunteers dressed up as trees and stood very still, this was found to be suitably effective and also had the added benefit that some tourists thoughts that we were 'living statues' and took photos of us and left piles of coins at our feet. Mating - male pigeons like to display their virility by charging around on a testosterone fuelled mission in a bid to impress their female counterparts. Playing - sometimes pigeons get bored and chase each other for fun. This may be inspired by the myriad car chases in recent Hollywood films. This behaviour is thought to be linked to the increase in outdoor screening of films that has been observed in London over the last couple of years. Mating rituals are predominantly characterised by chase scenes where male pigeons can be seen to puff out their chests and make their plumage more voluminous. 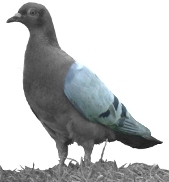 The male pigeon then typically angles his head so that it is perpendicular to the ground and then proceeds to charge forwards towards the nearest female pigeon. The male then seeks to impress the female by performing a complex pigeon dance, this predominantly involves running around in small circles and fighting any other males that get too close. Whilst doing his moves the male coos seductively in the female's direction, whilst making 'the eyes' at her. This ritual usually ends in one of two ways, either the female is suitably impressed and she proceeds to bend over and present herself or (as happens most of the time) the manliness is too much for her, she panics and flies away. If the female flies away the male tends to follow her and begin the entire process again once they both land. Once the male pigeon and the female pigeon have decided that they like each other, they may reproduce. 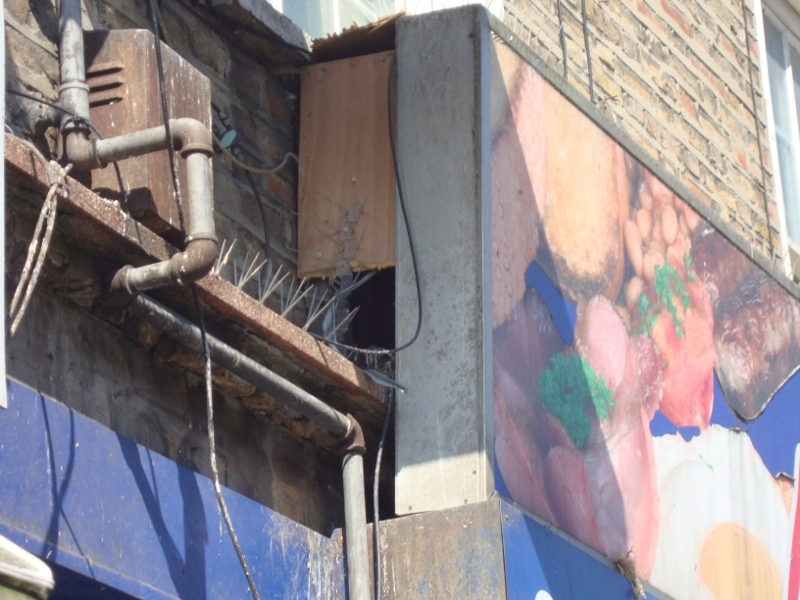 The female pigeon retires to a comfortable home behind a shop hoarding or under a bridge, which is suitable for the upbringing of a baby pigeon. Interestingly no-one has ever seen a baby pigeon or pigeons copulating. Whilst there are some 'photographs' out there on cryptozoology websites of infant pigeons I have analysed these in depth using Error Level Analysis and it is clear that they are all doctored in some way (e.g. through the use of photoshop). This has led me to believe that Aristotle in History of Animals was correct and that pigeons (and other lesser life-forms) generate spontaneously. My hypothesis is that pigeons come about when pigeon love is mixed with a bit of grime, guano and feathers. When the infants spawn they are fully formed and only a little smaller than full adults. Within a week or two they are fully grown and can go about their life. It is thought that pigeons enjoying a perch is due to the fact that for thousands of years they were all domesticated and that the cages which they were kept in all tended to have a perch. Although they have mostly all now managed to escape human captivity (the Great Escape is thought to have happened in 1944) and now they live in the wild this one element of their behaviour has remained unchanged. Pigeons use their beaks to groom themselves and to style their plumage. They use their beaks to pluck feathers that are untidy, old or dirty. As they cannot reach their backs and their undercarriage they rely on their close family and friends grooming these areas. Although most pigeons tend to be moderately conservative, there are some that exhibit far-right tendencies. These pigeons get their friends to pull out all of the feathers on their head, giving them a distinctive 'skin head' appearance. There are rumours that some of these pigeons have been seen wearing puffa jackets, but this seems a bit outlandish to me. Pigeons sometimes unfold their wings and flap them, this creates a waft of air which bounces off the floor and pushes the pigeon off of the ground (they do not weigh much) allowing them to fly. The further the pigeon is from the ground the harder they have to flap to fly, this is because as the gust of air travels to the surface of the earth and back again it loses force. This means that pigeons are usually limited to only flying about 20m or so above the ground. They can use this flight to cover distances more quickly than on foot. Flight also allows pigeons to get high up to perch. And to escape from cats. As part of my study I have estimated the population of pigeons in London to be c.0.85 million +/- 0.2million. In order to establish this figure, the whole of London was split up into a grid of areas of 10m by 10m. One hundred of these areas were then randomly sampled (for the geeks out there, each slot was stratified by geography and a random start was used and a one-in-n slot selection technique was used). For each of the 100 slots selected a random day of the week and time was selected for the survey. The number of pigeons found in the 100m2 grid were then counted at the allotted time. The average number of pigeons was then multiplied by the number of slots to get an estimate of the number of pigeons in London. It has been estimated that pigeons save British councils £10bn each year on the cost of street cleaners. Indeed, without pigeons hoovering up the chips dropped by schoolchildren an extra 3 tonnes of litter would have to be cleared up every day. Focusing solely on London, this equates to about £1.8bn a year! I have also conducted an extensive study on pigeon guano. I have analysed the amount of droppings produced by pigeons under five different railway and road bridges in London over the period of a calendar month. The results were then scaled up to account for each bridge in London and this provides us with an estimate of 2 tonnes of guano being produced under bridges in London each month. If this were to be collected in an efficient manner it could be turned into fertiliser and produce £100m of revenue to the public purse. I think that the most efficient way of doing this would be for London Local Authorities to build pigeon houses in popular pigeon spots, these could then act as guano factories with the substance harvested efficiently on a weekly basis. Whilst there would be some initial outlay required to meet this cost, this is thought to only be in the region of £1-2m for each of London's Boroughs. Providing central housing units to pigeons would also limit the amount of damage which their excrement causes to properties and stone work. Pigeon excrement is acidic and this can cause damage to statues and the frontage of buildings - it is estimated that £95m is spent cleaning up and repairing damage caused by pigeon excrement every year. It is my belief that the provision of pigeon housing has the potential of halving this bill, as most guano would be produced within the houses. 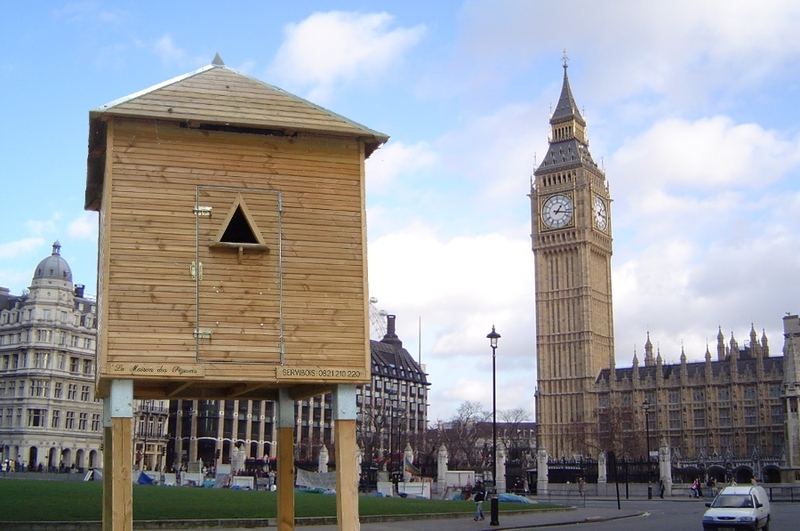 The provision of pigeon houses would also better enable the population of pigeons to be tracked which could mean that measures to control their population could be more easily taken. It is also my belief that these houses could become tourist destinations, becoming as much of an emblem of London as the Houses of Parliament or the red Routemaster bus. Money could be made by selling people seeds and grain to feed them. Economists have estimated that this could bring an extra 100,000 tourists to London every year. Given the assumption that each tourist will stay in a hotel for three nights, eat their main meals at a restaurant every day and go to one West End show, this has the potential of bringing in £12bn to the British economy every year! Some artists impressions of what such pigeon houses in London could look like have been included below. 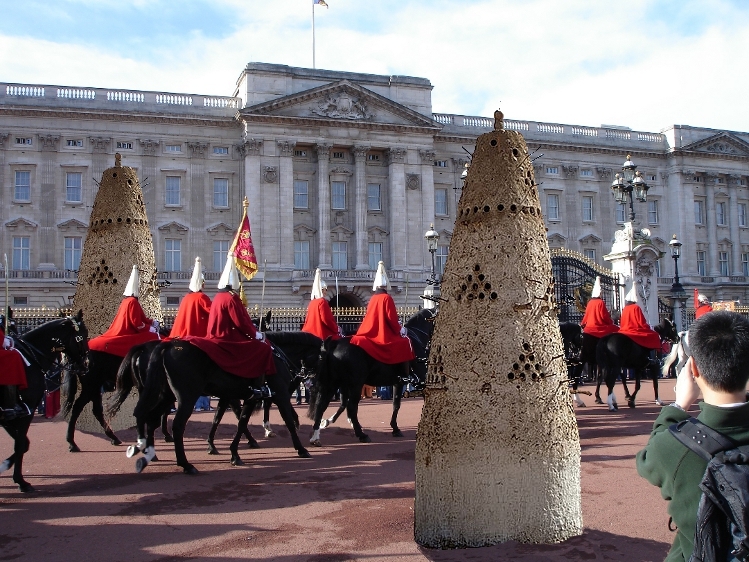 As shown in the image above, it is a real possibility that in the future tourists will come to Buckingham Palace to see the pigeons and their splendid houses rather than to watch the changing of the guard! It is an unfortunate reality that there may be some negative impacts of pigeons living in close proximity. Whilst these are negligible compared with the positives outlined above, this work would not be complete without bringing both sides of the argument to the reader's attention. Firstly, there is the risk that more people may become pigeon fanatics and that they may spend too much time watching them and not being productive to society. Secondly there are some human diseases and ailments which can be caused by pigeons. One of the most well known diseases is 'pigeon breeders lung', this is where people that live in close proximity to pigeons inhale small particles of feather and guano - this can irritate the linings of the lungs and cause health complications. It is also now thought that Black Death in the Middle Ages may have been caused by a fleas which lived on little mice that lived on pigeons. Pigeons are thought to have been instrumental in the spreading of the disease as they flew from city to city and country to country. Finally there are also concerns that this may lead to a surge in the number of people engaging in pigeon racing and that this may impact negatively on the number of people with a gambling addiction. I therefore propose that any scheme which intends to integrate pigeons and humanity closer together should have a lengthy consultation process with Gamble Aware and health professionals in order to minimise any possible negative effects. Technology has been used to benefit mankind hugely, but surely it is now time for humans - as the primary intelligent species on earth - to share these benefits with animals. After all, the advancements that have been made in science and industry have come at a huge cost to the natural world and to the other species which are forced to share the planet with humanity. I propose that additional taxes should be levied based on the pollution which corporations produce, these funds could then be invested in improving the lives of animals. I suggest the formation of a charity to manage these funds on behalf of animals until they are capable of handling the funds themselves. It is important to note that the following ideas have been discussed with academics that specialise in the field of futurology and they all reacted in a most positive manner and felt that these ideas were all realistic possibilities. I believe that pigeons should be given the opportunity of choosing their own destiny. They should all be given the option of remaining on this planet and benefiting from mankind's technology or leaving the earth to go and populate a new planet which will be free of humanity. As pigeons are unable to talk I suggest that all pigeons are lined up in single file, when they get to the front of the queue they can then choose which path to take. Left towards a rocket which propels them to new horizons or right towards a new era of technological progress on planet earth. I believe that it is only sensible that the first technological development that should be made for pigeons that choose to remain on the earth is the creation and implantation of cyborg brains that would allow pigeons to have higher intelligence levels. I imagine that this new technology would either take the form of a transplant of a human brain into a pigeon's body or that computers will become suitably advanced and able to run from energy produced from the digestion of organic material. With the help of an eminent futurologist we studied the rate at which technology has advanced over the past century and it is our belief that one of these technologies should become reality by around 2027. Once this development has been made they will then be capable of managing the funds allocated to them and to decide how they should be invested and which other technological developments should be prioritised. I envisage the funds being split equally between each pigeon and they will all be allowed to spend money in the way which they see fit. For instance, it is possible that some pigeons once they have a greater intellect may start to appreciate fine art and therefore wish to be able to see all the different shades and hues humans can see in order to appreciate art fully. These pigeons may then choose to spend their money on getting bionic eyes implanted - an artist's impression of a pigeon with a bionic eye is given below. Other pigeons may become interested in fashion and spend their money on items of clothing. In the images below we have two pigeons trying out different looks. Some pigeons may suddenly find that now they have a greater intelligence that flying around, perching and eating seeds no longer makes them feel intellectually fulfilled. They may suddenly wish to read books and magazines, write letters and emails or to use computers activities which it is hard to do with only a beak, wings and feet. 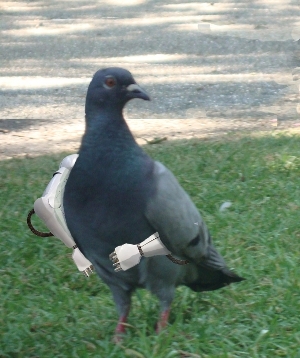 These pigeons may wish to get bionic arms implanted into their bodies - an image of what this may look like is included below for the reader's benefit. It would become incredibly tiresome for pigeons to have a great capacity for thought and to only be able to vocalize these by cooing. Therefore, it is suggested that speakers are built into the bionic brains that pigeons have installed - these would be used to vocalise all thoughts. In order to make life less monotonous I foresee that each pigeon will be able to select their own 'voice' from those of famous figures throughout history (for example Stephen Hawking or Lloyd Grossman). If pigeons wish to live lavish lifestyles which cannot be supported by their revenue from the pollution tax they will need to find a job. I suggest that their small size and flying ability will make them ideal private investigators, spies or couriers. Obviously, those that have arms will also be fully capable of doing any office job, so pigeons in the 21st Century may well become accountants, lawyers or even investment bankers. 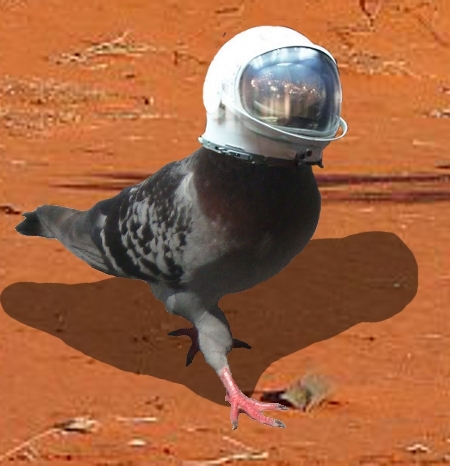 The pigeons that choose to leave the earth will travel across space in specially built rockets with controls that pigeons can use. It is impossible to know where the pigeons that choose to depart the earth may end up. However, my analysis leads me to believe that it may well be Planet HD 218566 b. I suspect that Planet HD 218566 b has nutrient rich soil and a plentiful supply of seeds which the pigeons will enjoy snacking upon. The composition of the atmosphere is mainly Nitrogen and Carbon Dioxide, with quite limited Oxygen supply, I suspect that the pigeons may well need to wear space helmets at all times. This may make it difficult for them to eat food and may lead to starvation. Our calculations indicate the the journey would begin sometime in March of 2032. 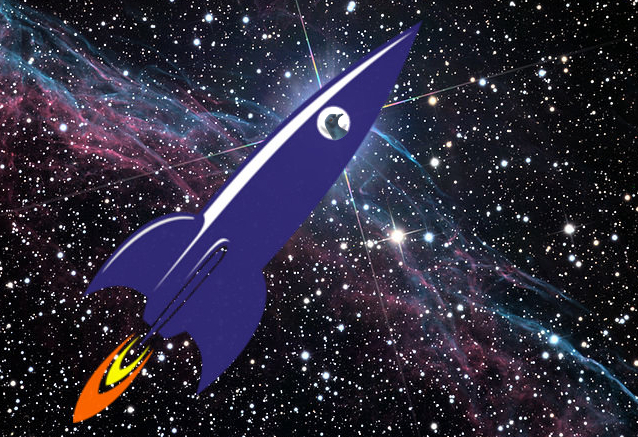 Given advances in rocket technology and the fact that the planet is 97.6044ly from the earth, we suspect they may not actually arrive in the 21st century. In order to ensure that the pigeons survive the trip, we think that they may have to be frozen and then thawed in a microwave upon arrival. Although some 'experts' argue that evolution happens at a scale too slow to be observed by humans, I think that these 'experts' may be wrong. 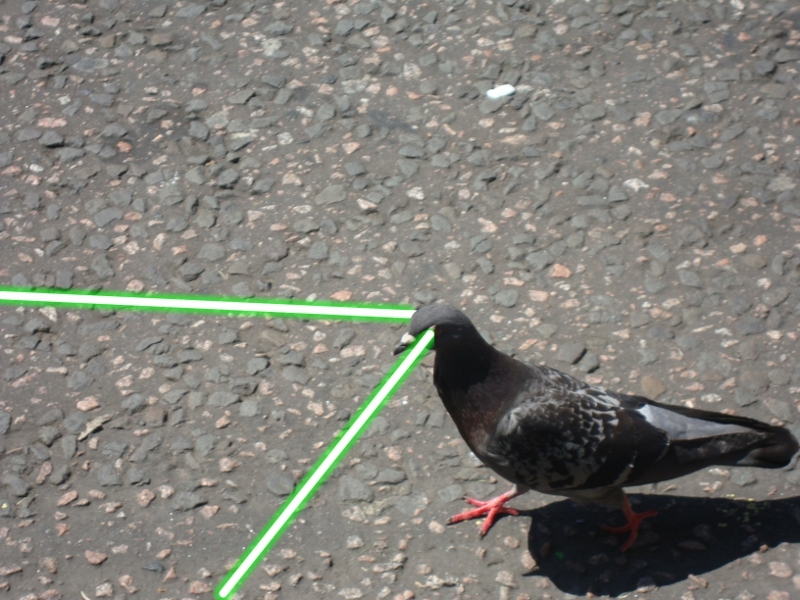 Who can honestly say that they are certain that pigeons will not evolve laser vision? The world is a magical place. To the cynics and the sceptics: I'm sorry for you. I'm sorry that you can't dream big. I'm sorry you don't believe in miracles.